(CNN) -- The sagging economy is taking a bite out of federal school-meal subsidies as more students take advantage of free or low-price breakfasts and lunches, nutritionists say in a report released Thursday. 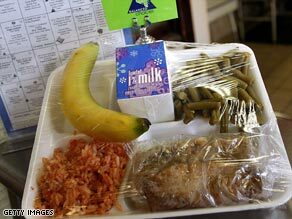 About 425,000 more students are participating in the National School Lunch Program, a group reports. The School Nutrition Association surveyed more than 130 school nutrition directors from 38 states to produce its report, "Saved by the Lunch Bell: As Economy Sinks, School Nutrition Program Participation Rises." The nonprofit organization said that about 425,000 more students are participating in the National School Lunch Program and the School Breakfast Program in 2008-09 than in the previous school year. That represents an average increase of 2.5 percent from 2007-08, the report says. These numbers hold true despite a slight decline in the number of students enrolled in public schools this school year, according to the study. More than three-quarters of the districts surveyed reported a rise in the number of students eating free meals under the U.S. Department of Agriculture program, the report says. Many of the school district employees who monitor the food programs complain that the federal subsidies fall far short of the rising costs. According to the association, the estimated average cost to prepare a school meal is $2.90, but the federal reimbursement is $2.57. School lunch programs are experiencing a potential loss of at least $4.5 million per school day, based on 30 million school lunches provided, the group says. The good news, according to association President Katie Wilson, is that "this year, when hunger is more common, more students are able to eat a balanced, nutritious meal at school." Meals served under the USDA programs must meet nutrition guidelines based on the Dietary Guidelines for Americans. For lunches, that means no more than 30 percent of calories can come from fat and fewer than 10 percent from saturated fat.